Your business may need to keep track of dozens of different initiatives—but that doesn’t mean you need dozens of separate storage solutions to get the job done. 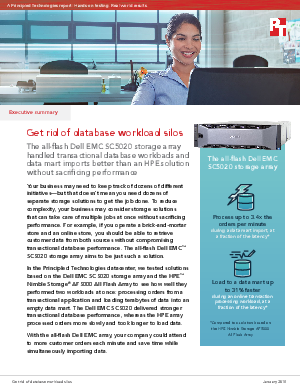 To reduce complexity, your business may consider storage solutions that can take care of multiple jobs at once without sacrificing performance. For example, if you operate a brick-and-mortar store and an online store, you should be able to retrieve customer data from both sources without compromising transactional database performance. The all-flash Dell EMC™ SC5020 storage array powered by Intel® Xeon® processor aims to be just such a solution.